Many a times rivalry exist in Tamil cinema, Right from MGR -Sivaji ,Rajini-Kamal ,Ajith-Vijay and the real tug of war will happen when the films of these arch rivals got released in the same day. Thalapathi-Guna ,Pokkiri-Azhwar are some examples and their fans will go gaga over their idol's films in order to show their mass in Box office. But many a times any one of this film will win over the other. For example when Thalapathi and Guna were released at the same time Thalapthi won the race over Guna, same exist when Pokkiri dominated Azhwar. After the issue between Ajith and Vijay sorted out , they become friends and their films were not released on same day. But this Box office battle is happened when Suriya's 7aam arivu and Vijay's Velayudham got released during Deepavali 2011. 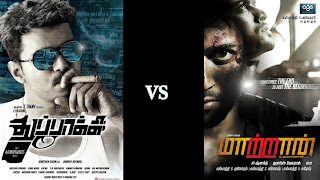 To be honest both the films got separate audience and Vijay's velayudham proved to be a slight-upper hand in the battle . Media, Television, Movie portals were in a urge to publish the BO report during last deepavali in order to maintain the hit rates as their news will draw larger audience. Today EROS international who acquired the rights of Suriya's Maatran directed by KV Anand revealed that they are planning to release the film on August 15. Meanwhile Kalaipuli S Thanu who is Producing Vijay's Thuppaki directed by AR Murugadoss is also in a thought of releasing the movie on August 15. 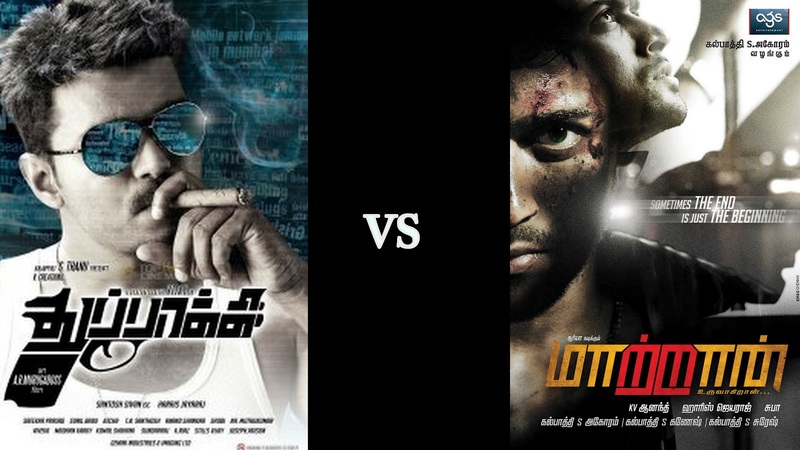 Will it be a another Box office clash between these Super stars? All Media eyes are on Thanu to announce the release date of Thuppaki. Fans are you ready for this Battle? Grand welcome to booming technologies and bade farewell to good old screenplay writing?